Natural History of San Francisco Bay (University of California Press, 2011). The 352-page book, published by the University of California Press as part of its series of California Natural History Guides, explores the hydrology and geology of San Francisco Bay and its vast watershed, its myriad plant and animal inhabitants, and the profound impacts from the cities, industries and thoroughfares that now ring the bay. The book also captures the optimism of researchers involved with one of the country's largest environmental restoration efforts, as well as the ongoing threats to the estuary from climate change. 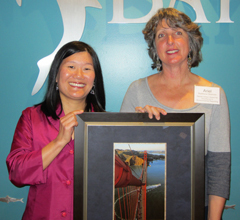 Wong and her coauthor, San Francisco–based freelance journalist Ariel Rubissow Okamoto, were honored by The Bay Institute at an awards ceremony on April 11 at the Aquarium of the Bay in San Francisco. Rubissow Okamoto, a longtime correspondent on San Francisco Bay water issues, was invited by UC Press to write a primer about the bay—the West Coast's most urbanized estuary—and its watershed. Her vision for the book, infused with human stories and narrative journalism about restoring the estuary to health, was not typical for an entry in the venerable guidebook series by UC Press. Rubissow Okamoto asked Wong to help reshape the manuscript and to report, write, and edit new material. The pair also acquired historical and current photos—including many taken by Wong's husband, Max Eissler. All told, Rubissow Okamoto worked on the volume for about five years, and Wong for more than two. "Giving birth to this book felt endless at the time, but like any proud parent, I now feel the effort was entirely worthwhile," Wong says. The partnership was ideal, Wong adds. 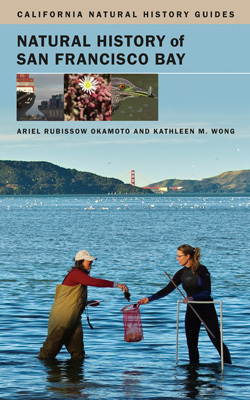 "[Ariel's] strong relationships with bay scientists and broad knowledge of California water issues have shaped my reporting and sparked a whole new appreciation for the wonders of the bay," she writes in the book's acknowledgments. The award is named for Harold Gilliam, a former columnist for the San Francisco Chronicle and author of numerous books about San Francisco and the region's natural history. "After experiencing, researching, and writing about San Francisco Bay over a period of 50 years, I was certain that I knew all there was to know about it," Gilliam says. "I was wrong. Rubissow Okamoto and Wong have enabled me to see it in a new dimension—call it 3D, or maybe even 4D." Wong earned a dual B.A. in biology and English/American literature from UC Santa Cruz before enrolling in the Science Communication Program in 1998. She worked as an intern at U.S. News & World Report, then as a staff reporter for the Monterey County Herald. For several years, Wong was senior editor at California Wild, the former magazine of the California Academy of Sciences. She now works as principal publications coordinator for the University of California Natural Reserve System in Oakland. Rubissow Okamoto has worked as a freelance journalist for 25 years. Her main clients have included the Sierra Club, Urban Ecology, the Oceanic Society, the San Francisco Estuary Partnership, and the U.S. Geological Survey. Her articles have appeared in the San Francisco Chronicle and Bay Nature. She also is the author of Guide to the Parks, the first guide to the Golden Gate National Recreation Area.